Refurbished room in Restaurant Patrick Guilbaud. IRELAND’S MOST CELEBRATED restaurant is enjoying its best ever year this year as diners are flocking to Restaurant Patrick Guilbaud in Dublin. 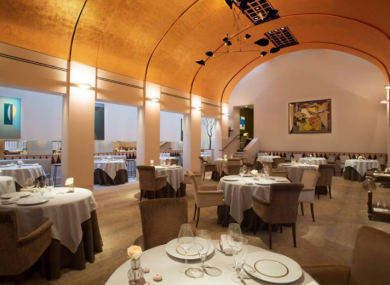 The restaurant is Ireland’s only two star Michelin restaurant, and director, Stephane Robin said yesterday that 2017 is turning out to be the restaurant’s “best ever year” since it opened 36 years ago. The stellar performance by the restaurant in 2017 follows three consecutive record-breaking years in 2016, 2015 and 2014 as the restaurant benefits from the boom in fine dining and the recovering economy. Robin was yesterday commenting on new accounts for the restaurant firm, Becklock Ltd showing that accumulated profits at the business increased by €210,458 going from €564,531 to €774,989 in the 12 months to the end of August last. The firm’s cash pile during the year increased more than four fold going from €371,419 to €1.48 million. The famed restaurant is housed in the five-star Merrion hotel in Dublin and counts two of Ireland’s best known businessmen, Martin Naughten and Lochlann Quinn as minority shareholders. Robin said yesterday that for the restaurant to attain a third Michelin star “is a dream. Never kill the dream”. Robin said that the consistency in the quality of the food and the service has never been as high as it is today at the restaurant. Robin said that the restaurant’s lobster ravioli, wild salmon, king crab and Wicklow Hills lamb fillet are very popular right now. Those who opt for the evening eight course can pay €185 per head, or can pay €120 for a three course meal while a two course lunch costs a more affordable €50 per head. Robin said that the restaurant is benefiting from the “huge amount of tourists in Dublin this Summer, especially the number of Americans. It is quite amazing”. Last year the restaurant closed for three months for renovations and Robin said that the refurbishment is paying off today. The refurbishment involved a new kitchen equipped with the latest technology and Mr Robin said that the business deliberately did not increase the number of tables beyond the existing 20. The restaurant employs 38 and staff costs, including directors’ pay, last year totalled €1.29 million. The other directors are listed as Patrick Guilbaud, who has a controlling interest and Guillaume Lebrun. Email “Ireland's only two star Michelin restaurant served up record profits last year”. Feedback on “Ireland's only two star Michelin restaurant served up record profits last year”.